Willie Lee McCovey (born January 10, 1938), nicknamed "Mac", "Big Mac", and "Stretch", is a former Major League Baseball first baseman. He played nineteen seasons for the San Francisco Giants, and three more for the San Diego Padres and Oakland Athletics, between 1959 and 1980. He batted and threw left-handed and was inducted into the Baseball Hall of Fame in 1986. One of the most intimidating power hitters of his era, McCovey was called "the scariest hitter in baseball" by pitcher Bob Gibson, an assessment with which Reggie Jackson concurred. McCovey's powerful swing generated 521 home runs, 231 of which he hit in Candlestick Park, the most hit there by any player, and included a home run of September 16, 1966 described as the longest ever hit in that stadium. Prior to playing for the San Francisco Giants, McCovey played for a Giants' farm club in Dallas, Texas that was part of the Class AA Southern League. In that league, he did not participate when his team played in Shreveport, Louisiana due to segregation in that city. He later played for the Pacific Coast League Phoenix Giants just prior to joining the San Francisco Giants. In his Major League debut on July 30, 1959, McCovey went four-for-four against Hall-of-Famer Robin Roberts of the Philadelphia Phillies, hitting two triples and two singles, en route to a .354 batting average that year, in which he won the NL Player of the Month award in August, his first full month in the majors (.373, 8 HR, 22 RBI). He then took National League Rookie of the Year honors while playing in just 52 games. He had a 22-game hitting streak, setting the mark for San Francisco Giants rookies that still stands, just four short of the all-time team record. Three years later, he helped the Giants to the 1962 World Series against the New York Yankees. 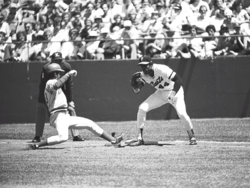 Perhaps McCovey's best-known moment in baseball came in the bottom of the 9th of Game 7, with 2 outs and the Giants trailing 1–0. With Willie Mays on second base and Matty Alou on third, any base hit would likely have won the championship for the Giants. McCovey scorched a hard line drive that was snared by the Yankees' second baseman Bobby Richardson, ending the series with a Yankees' win. That would turn out to be the closest McCovey would get to playing on a world championship team. In the early years of Candlestick Park, the Giants home stadium, the area behind right field was open except for three small bleacher sections. When McCovey came to bat, typically those bleachers would empty as the fans positioned themselves on the flat ground hoping to catch a McCovey home run ball – anticipating the gathering of boats in McCovey Cove, a generation later, when Barry Bonds would bat. In 1974, McCovey was traded to the San Diego Padres; without him, the Giants' fortunes declined. Near the end of the 1976 season, the Oakland Athletics purchased his contract, but he would only play eleven games for them. McCovey returned to the Giants in 1977. With Hank Aaron and Frank Robinson having retired at the end of the 1976 season with 755 and 586 home runs respectively, McCovey began 1977 as the active home run leader with 465. That year, during a June 27 game against the Cincinnati Reds, he became the first player to hit two home runs in one inning twice in his career (the first was on April 12, 1973), a feat since accomplished by only Andre Dawson and Jeff King. One was a grand slam and he became the first National Leaguer to hit seventeen. At age 39, he had 28 home runs and 86 RBI and was named the Comeback Player of the Year. On June 30, 1978, at Atlanta's Fulton County Stadium, McCovey hit his 500th home run, and two years later, on May 3, 1980, at Montreal's Olympic Stadium, McCovey hit his 521st and last home run, off Scott Sanderson of the Montreal Expos. This home run gave McCovey the distinction, along with Ted Williams (with whom he was tied in home runs), Rickey Henderson, and Omar Vizquel of homering in four different decades: the 1950s, 60s, 70s, and 80s. McCovey is one of only 29 players in baseball history to date to have appeared in Major League baseball games in four decades. In his 22-year career, McCovey batted .270, with 521 home runs and 1,555 RBI, 1,229 runs scored, 2,211 hits, 353 doubles, 46 triples, a .374 on-base percentage and a .515 slugging percentage. He also hit 18 grand slam home runs in his career, which is still a National League record. Willie McCovey's number 44 was retired by the San Francisco Giants in 1980. McCovey was inducted into the Hall of Fame in 1986. It was his first year of eligibility and he appeared on 346 of 425 ballots cast (81.4 percent). In 1999, he ranked 56th on The Sporting News' list of the 100 Greatest Baseball Players, and was nominated as a finalist for the Major League Baseball All-Century Team. Since 1980, the Giants have awarded the Willie Mac Award to honor his spirit and leadership. 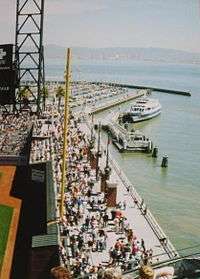 The inlet of San Francisco Bay beyond the right field fence of AT&T Park, historically known as China Basin, has been redubbed McCovey Cove in his honor. Across McCovey Cove from the park a statue of McCovey was erected and the land on which it stands named McCovey Point. The Giants retired his uniform number 44 on September 21, 1980, which he wore in honor of Hank Aaron, a fellow Mobile, Alabama native. McCovey was inducted to the Afro Sports Hall of Fame, February 7, 2009 in Oakland, California. McCovey is a senior advisor with the Giants. In 1996, McCovey was fined and given two years' probation for tax charges stemming from inadequate reporting of income earned from 1988 to 1990. In September 2003, McCovey and a business partner opened McCovey's Restaurant, a baseball-themed sports bar and restaurant, located in Walnut Creek, California. ↑ Shea, John. Blowing out the candle, The San Francisco Examiner. April 4, 1999. 1 2 Dickey, Glenn (January 30, 2005). "CATCHING UP WITH WILLIE MCCOVEY / Back in the swing of things / Giants great on mend after surgery". The San Francisco Chronicle. ↑ Shea, John (July 30, 2010). "Streak ends". SFChronicle.com. Retrieved Jul 30, 2010. ↑ "100 Greatest Baseball Players by The Sporting News : A Legendary List by Baseball Almanac". Baseball-almanac.com. Retrieved 2013-01-11. 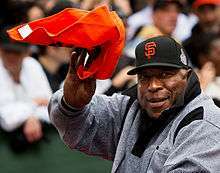 ↑ "Ex-baseball star Willie McCovey gets probation, fine in tax fraud case". Jet. 1996.